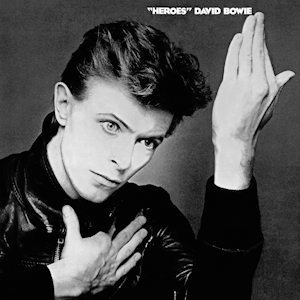 "Heroes" was a ground-breaking, adventurous, genre-busting album. It was controversial upon its release due to its almost blatantly uncommercial, "anti-rock" ambience. Released at the height of punk, it influenced so many of the "post punk" bands that soon were everywhere. It influenced bands like Magazine and Joy Division, but also synthesiser-dominated groups like The Human League and, later, New Order. It was one of the most influential albums of is time, without question. It is not an instant album. Not at all. Even its vocal numbers have bleak, clunky, dense soundscapes that broke all existing moulds and the instrumental numbers are seriously dark. Although Bowie had set the trend with the previous year's "Low", this was a far less accessible album even than that one, and that is saying something. While I personally have always preferred "Low", of these two stark, metallic semi-instrumental albums, I have always had a weakness for the mysterious "V-2 Schneider", the iconic title track and the unusual "Secret Life Of Arabia". The latest 2017 remaster has got me appreciating "Joe The Lion" and "Sons Of The Silent Age" a lot more. Just listen to that BIG booming bass intro to "Schneider" Beautiful. The intro to “Beauty And The Beast” is excellent too, and Bowie’s haughty, mannered vocal on “Sons Of The Silent Age” as well. “Blackout” is a frenetic, madcap drum-driven ride through all sorts of images. "Joe The Lion" is a perplexing, fascinating song. Who was he? What was it about? As I said, this is not an instant album but it has a strange, growing appeal. I often return to it. The sonorous, dense, metallic industrial beauty of "Sense of Doubt", "Moss Garden" and "Neuköln" sounds just wonderful on this remaster too. This instrumental part of the album was as baffling to people at the time as the similar side of "Low" had been, but for most, the more you listened to it, the more oddly appealing it became. It set the foundations for so much subsequent ambient music. Regarding the new, quite controversial remastering of the album, contrary to what many others have felt about these latest batch of 2017 Tony Visconti remasters, I absolutely love them and feel they are the best ever remasters of what were always, for me, and I stress, for me, frustratingly tinny albums. Each to their own I suppose. I love my music to be "big" and very bass heavy, so these remasters do the job for me, and some. 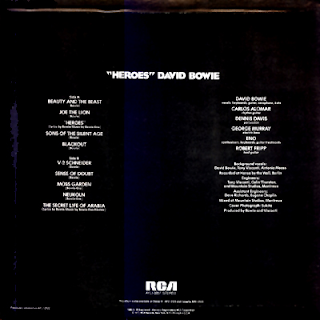 Before this edition, I did not listen to "Heroes" so much. Now I listen to it a lot more. I watched a brief video clip where Tony Visconti talked through the creation of the title track and it introduced me to sounds contained within it that I really had not realised were there. I find all the EMI/RYKOs somewhat lo-hi, muffled and just not my sonic cup of tea. I own them all for the bonus material. The 1999s are an improvement but these 2015-2017 ones give me the most satisfaction, but as I said, that is just me. They suit me but don't seem to suit many others.